It's easy to feel powerless in the face of big environmental challenges-but we need inspiration more than ever. With political leaders who deny climate change, species that are fighting for their very survival, and the planet's last places of wilderness growing smaller and smaller, what can a single person do? 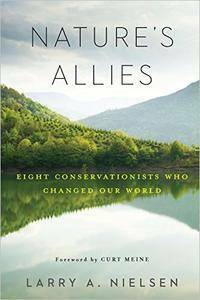 In Nature's Allies, Larry Nielsen uses the stories of conservation pioneers to show that through passion and perseverance, we can each be a positive force for change. In eight engaging and diverse biographies-John Muir, Ding Darling, Aldo Leopold, Rachel Carson, Chico Mendes, Billy Frank Jr., Wangari Maathai, and Gro Harlem Brundtland-we meet individuals who have little in common except that they all made a lasting mark on our world. Some famous and some little known to readers, they spoke out to protect wilderness, wildlife, fisheries, rainforests, and wetlands. They fought for social justice and exposed polluting practices. They marched, wrote books, testified before Congress, performed acts of civil disobedience, and, in one case, were martyred for their defense of nature. Nature's Allies pays tribute to them all as it rallies a new generation of conservationists to follow in their footsteps. These vivid biographies are essential reading for anyone who wants to fight for the environment against today's political opposition. Nature's Allies will inspire students, conservationists, and nature lovers to speak up for nature and show the power of one person to make a difference. Please check my blog to get more stuff every day!